I'm back with my cosplay for the day. This time featuring the lovely tough as nails older Fujibayashi twin, Kyou. Enjoy! I'm back with my cosplay for the day. This time featuring a really cool and unique Bleach villain, Ulquiorra. For all you Bleach fans I hope you like what you see. It certainly put a smile on my face and that smile was half the reason. Someone who appears to be having a great time and looking good doing it. Oh... I recognize her. She got her start doing Pikachu cosplay. She's a regular attendee at the big conventions. The poor, cute, moe wolf girl is ignored by the dorks playing their handheld video games. For shame! I'm back with my cosplay for the day. This time for all you Highschool DxD fans, myself included, out there. Here I present the series very own sweet and lovely blonde, Asia. I hope you all enjoy! Season 2 here we come! I'm back with my cosplay for the day. This time featuring our favourite High School DxD mascot character, Koneko Toujou. Enjoy. They are fighting to protect their lolis. They're emulating their hero, Keima. Hi. Just as promised, here's the report on day 1 of The Grand Pop Culture Fair last Saturday, held at SM Megamall Megatrade Hall 3. This anime convention is smaller than Cosmania, and the cosplayers aren't that many. There's a lot of singing on stage in the afternoon though - it's a culture fair after all. And this is the first time I've heard "Heavy Rotation" (an AKB48 song) played in an anime convention. First cosplayer I met that day. She wears a cosplay similar to the grey AKB48 uniform. Next cosplayer, and she's cute! Sword Art Online merchandise. I bought one of the Asuna pins. Went out of the megatrade hall, and saw an elf. She really looks like an elf archer from an RPG. Went back inside the megatrade hall, and saw two more cosplayers. It's just not fully shown in the pic, but the Saber cosplayer has a really large sword. Anjeline cosplaying as a female version of Vincent from FF7. Angelica cosplaying as.. sorry, I forgot. Should have asked you again. 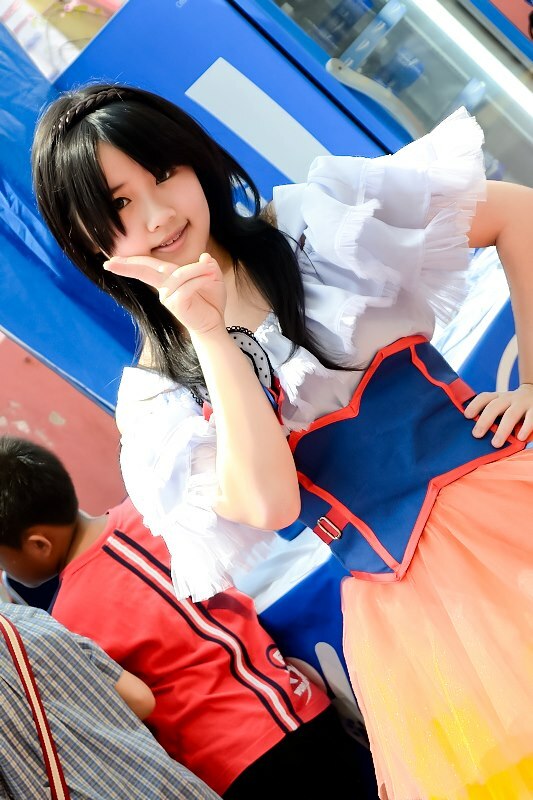 Anyway, she joined the cosplay competition held during day 1. Buy some cute souvenirs or eat Taiyaki? Rina doing a Miku Hatsune cosplay - she has a Miku bag too (carried by her mom). Her mom is quite supportive of her being a cosplayer. While talking with them, I mentioned that a cosplay contest will be held in a few minutes - they went to the organizers and joined the contest. It's amazing how she was able walk well on stage without any practice. Taking pic of some more cosplayers before going home. Sabrina, saw her inside the megatrade hall. I think her cosplay is good. Sharmaine doing a cosplay of a character from Inu x Boku. I see her often in cosplay events. And she joins cosplay competitions too. Mami Tomoe cosplay. Here you can also see the entrance to Megatrade Hall 3. No, not going home yet because there's still the cosplay competition. Went back inside. This masked man is familiar, asked him if he's the same person I saw at SM North Mall. He answered in pantomime that he's not the same person I saw at a previous con. Cosplay competition. Total of 21 cosplayers registered.. 4 didn't show up, so there's a total of 17 participants. Not many compared to Cosmania, but it's still fun event that night. Sorry for the blurry pics, it's hard to take pictures of people that are moving. Went home at a little past 7:30 pm. It's been a good day. I managed to take videos of some performers during the singing competitions. Also managed to buy some AKB48 posters (Mayuyu, Kojima and Tomochin). Well, that's all to my report. Thanks for reading. Small anime conventions like this one can be just as fun as the larger ones. Last edited by Liddo-kun; 2012-11-30 at 20:34. Otaku! We only care about 2D girls! However, this is very... ehmm.. realistic? LoL. Such a cute pic. Is she a model ? Hi. Just as I've said on a previous post. Will try to attend one of the conventions that will be held this October. Attended day 1 of The Grand Pop Culture Fair last Saturday, held at SM Megamall Megatrade Hall 3. Other cosplayers that I saw inside the Megatrade Hall. Great pics as always Liddo-kun . Is this from an anime ? She looks like Natsume from Tenjho Tenge . She also did some Kobato, Lacus and Mikuru. Sorry for quoting my own post. Her mom contact me on YM today, that her daughter won 1st place on the cosplay contest held that night. Last edited by Liddo-kun; 2012-10-17 at 07:07.